Development, stages, and risk factors. Gastric cancer is a malignant tumor arising from stomach lining. The stomach is a hollow organ in the upper abdomen under the ribs that is part of the digestive system. Food moves from the mouth through the esophagus to the stomach where food becomes liquid and pushed into the small intestine by muscles in the stomach wall. Gastric cancer usually begins in the inner layer of the stomach (mucosa), where juices made by glands in the inner layer help digest food. Over time, cancer may invade more deeply into the stomach wall. A stomach tumor can grow through the stomach’s outer layer into nearby organs, such as the liver, pancreas, esophagus, or intestine. A tumor, growth, or polyp, is caused by buildup of extra cells that forms a mass. Tumors in the stomach can be benign (not cancer) or malignant (cancer). Benign tumors are not as harmful as malignant tumors. Metastasis is the spread of cancer. Gastric cancer cells can spread by breaking away from the original tumor, entering blood vessels or lymph vessels that branch into tissues, forming new tumors. The new tumor has the same type of abnormal cancer cells and is still known and treated as gastric cancer. For example, if gastric cancer spreads to the liver, the cancer cells in the liver are gastric cancer cells. Chest x-ray: An x-ray of your chest can show whether cancer has spread to the lungs. CT scan: An x-ray machine linked to a computer takes a series of detailed pictures of your organs. You may receive an injection of dye. The dye makes abnormal areas easier to see. Tumors in your liver, pancreas, or elsewhere in the body can show up on a CT scan. Endoscopic ultrasound: Your doctor passes a thin, lighted tube (endoscope) down your throat. A probe at the end of the tube sends out sound waves that you cannot hear. The waves bounce off tissues in your stomach and other organs. A computer creates a picture from the echoes. The picture can show how deeply the cancer has invaded the wall of the stomach. Your doctor may use a needle to take tissue samples of lymph nodes. Laparoscopy: A surgeon makes small incisions (cuts) in your abdomen. The surgeon inserts a thin, lighted tube (laparoscope) into the abdomen. The surgeon may remove lymph nodes or take tissue samples for biopsy. Staging helps doctors determine treatment options. It identifies how deeply the tumor has invaded the stomach wall, whether the tumor has invaded nearby tissues, and whether the cancer has spread and if so where. Sometimes staging can only happen after the tumor and nearby lymph nodes are removed in surgery. 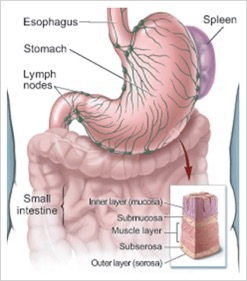 The tumor is found only in the inner layer of the stomach. The tumor has invaded only the submucosa. Cancer cells may be found in up to 6 lymph nodes. Or, the tumor has invaded the muscle layer or subserosa. Cancer cells have not spread to lymph nodes or other organs. The tumor has invaded only the submucosa. Cancer cells have spread to 7 to 15 lymph nodes. Or, the tumor has invaded the muscle layer or subserosa. Cancer cells have spread to 1 to 6 lymph nodes. Or, the tumor has penetrated the outer layer of the stomach. Cancer cells have not spread to lymph nodes or other organs. The tumor has invaded the muscle layer or subserosa. Cancer cells have spread to 7 to 15 lymph nodes. Or, the tumor has penetrated the outer layer. Cancer cells have spread to 1 to 15 lymph nodes. Or, the tumor has invaded nearby organs, such as the liver, colon, or spleen. Cancer cells have not spread to lymph nodes or to distant organs. Cancer cells have spread to more than 15 lymph nodes. Or, the tumor has invaded nearby organs and at least 1 lymph node. Or, cancer cells have spread to distant organs.